Dodowa (GAR), Nov. 18, GNA - President John Agyekum Kufuor on Thursday said with the satisfaction shown by Ghanaians in the Government's policies and programme that had improved their standard of living during its first tenure in office, its mandate would be renewed on December 7. He said, " Ghanaians have shown much appreciation for the good work done by the Government since 2001 and determined to renew its mandate. The people are satisfied and it would be unnatural to remove such a Government from power". President Kufuor made the observation when addressing a grand durbar of the chiefs and people of the Shai Traditional Area in the Dangme West District in the Greater Accra Region. He said when the New Patriotic Party (NPP) had the chance to rule Ghana in 2001 it had made tremendous improvement in governance to the admiration of the people. 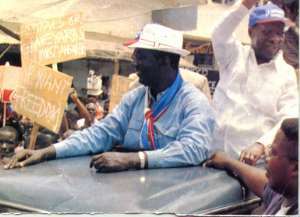 President Kufuor said the ballot paper was a mark of their authority to hold part of the power of Ghanaians; therefore, they should exercise their franchise wisely and vote for the NPP to continue with its good governance and improvement in the socio-economic development of the country. He said the upgrading of facilities at the GHANATTA Senior Secondary School and improvement in the provision of basic amenities in the area was part of the efforts by the Government to ensure Dodowa maintains its status in history. Nene Nagai Kasa VII, Paramount Chief of the Shai Traditional Area, in an address read on his behalf commended the Government for improvement in the social infrastructure of the area and pledged their support to the Government. President Kufuor later introduced Miss Gloria Akuffo, Deputy Minister of Justice and Attorney General as the NPP Parliamentary candidate for the Shai-Osudoku Constituency.